No traveler can really understand Boston without going to a Red Sox game at Fenway Park. It's not about the incredible legends and history, the home runs and high-fives, or the hot dogs and crackerjack - it's about the authentic community that rallies around the Red Sox every season. Now is the perfect opportunity for you to be swept up in the vibrant spirit of Red Sox, because 2018 has been the best season ever for the home team. Can the Red Sox make it all the way to win their 8th World Series title this year? Absolutely! The Red Sox have already taken home the American League East title, and they set a franchise record with their 106th win on September 24. SportsLine puts their pennant odds at 32.63% and their World Series odds at 17.99%. Right now the Red Sox have the best record in baseball, which gives them the home-field advantage during the postseason. Are you ready for a Red Sox World Series win? We are! Will the Boston Red Sox Be in the World Series This Year? When Do they MLB Playoffs Begin? When Is the World Series? The playoffs begin on Tuesday, October 2 with the MLB Wild Card Round. The Boston Red Sox play in Game 1 of American League Division Series, which will take place at Fenway Park on Friday, October 5. The seven games of the 2018 World Series are scheduled for October 23, 24, 26, 27, 28, 30, and 31. Location is TBD - but probably Fenway Park. Finding tickets to regular Red Sox games can be a challenge - and finding tickets to playoff games can be truly an epic (and expensive) quest. Numerous online vendors sell tickets in advance; you can expect to pay at least double the face value. We don't recommend purchasing tickets from scalpers, however they are always around on game day in Kenmore Square. It's not a ballpark - it's a shrine. Located just two miles west of Revere Hotel near Kenmore Square, Fenway Park has been the home of the Boston Red Sox since 1912. It's the most famous baseball stadium in the world, and also one of the smallest with less than a 40,000-person capacity. The landmark ballpark is replete with legends, stories, and quirky features that can have strange effects on the gameplay. The Triangle - Balls that land inside this magic zone almost always produce at least a triple play and often an inside-the-park home run. It's a special region of the ballpark's center field where the walls form a triangle whose farthest point is 420 feet from home plate. Pesky's Pole - Named after a Red Sox player from the 1940s and 50s, Pesky's Pole is the nickname for Fenway's right field foul pole. It was named after Johnny Pesky won a game in 1948 with a home run down the short right field line - just around the pole. The Green Monster - A favorite target for right-handed sluggers, Fenway Park's big, green left field wall is known by this popular nickname. It's more than 37 feet high and 310 feet away from home plate. It's the highest wall of any Major League Baseball Field and is famous for preventing home runs on many line drives. You can sit in terrace seating on top. 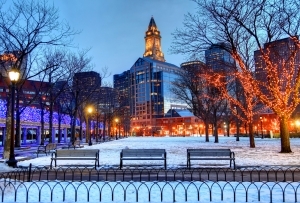 Put yourself in the heart of the city and embrace the ebullient sports spirit of Boston. Situated by Boston Common and the Freedom Trail, Revere Hotel is just two miles away from Fenway Park. 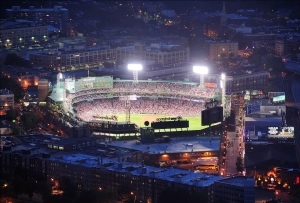 Book one of our exciting vacation packages and take your Red Sox experience to the next level. Conspire, Quench & Consume Package - Overnight accommodations plus two drinks in Rebel's Guild and a $25 food and beverage credit. Rooftop@Revere Package - Overnight accommodations plus a $50 food and beverage credit and late check-out. 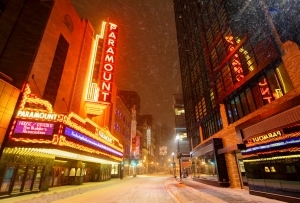 Netflix & Chill - Overnight accommodations with free Wi-Fi plus a $50 room service credit and in-room movie theatre amenity with popcorn, snacks, and candy. Rise & Shine Breakfast Package - Overnight accommodations plus a buffet-style breakfast for two and late check-out. Breakfast & Parking - Overnight accommodations plus a buffet-style breakfast for two and overnight self-parking for one vehicle. Escape to the city and discover all the best things to do in Boston right outside your door. Relax in a stylish getaway with a funky, history-inspired lobby lounge and upscale gastropub, Rebel's Guild. Chill out on the Your Boston. Your way. Make it happen - book your stay at Revere Hotel today!